Wool & Hoop offers ALL 421 lush Appleton Crewel Wool colors by the skein, which includes all of the colors found in our Wool & Hoop kits and in Katherine Shaughnessy's New Crewel books. 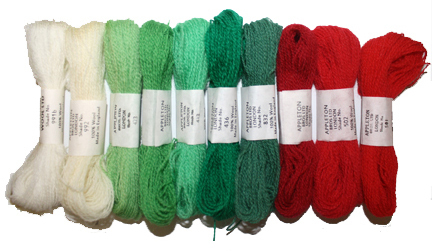 A skein of wool is 27 yards in length and perfect for stitching up your own designs or a Wool & Hoop iron-on. We also offer a special deal on the entire New Crewel palette as well as "Samplers" of selected Appleton colors to help round out your crewel wool collection. See below for details and other special offers. Note: The colors you see on your computer screen may not be exactly the same as the actual thread color. BUY THE ENTIRE COLLECTION & SAVE!!! labeled and sorted according to color groupings.